And so I go into my final con report post. I hope I remembered everything I meant to say. Despite my really bad start, with my fibromyalgia pain screaming for me to stay home, I was doing ok. I don't know if it was the vitamin patch my sister gave me, the painkillers I was popping, or even just the embracing atmosphere of the convention itself. In any case, I felt MUCH better on Sunday than I did on Saturday. When we last left our heroes they were sitting in the home base booth, eating lunch... Heidi, hubby-Eric, and I were hanging out together in the booth when James returned to tell Heidi she had to go visit Ethan Van Sciver, and that he was expecting her at the front of the line. See, Heidi had posted one of his covers in her on-going Is This Gratuitous? series, and Ethan had responded in the comments. So he wanted to meet Heidi, and she had an invitation to jump his line. She suggested I come along and Troll him at the same time. Thus, the Heidi and Laura fangirl tag-team was born! We arrived at the front of Ethan's line, and said hello a bit tentatively, but Ethan practically welcomed us with open arms. He immediately struck up a great discussion with Heidi about the cover, after first being trolled. Heidi and I kept apologizing to the poor guys at the front of the line that we'd sort of evicted, but Ethan continued to sign for them while talking, so neither of them seemed to take it too hard. Other folks, further back in the line, didn't look too happy and I don't blame them. Both of us felt pretty guilty, I think. But it was at Ethan's request, or we wouldn't have done it. Another topic of discussion that came up was Aquaman. Apparently Ethan and Geoff Johns have an idea for Aquaman which was mentioned during the DC dinner on Saturday night. Dan Didio did some squashing, leaving Ethan without much hope that he'd ever get to do Aquaman. We started brainstorming ways Aquaman could succeed, and mostly agreed that he needed to be a series of mini-series and not an on-going. Then I suggested DC Challenge: Aquaman, which got everyone laughing. The vast amusement potential of that idea stuck with me for the rest of the con. When I later mentioned it to Kurt Busiek he was actually speechless for a moment before saying, "That would be GHASTLY!" I agree, and that's why it would be wonderful. Now inspired, Heidi suggested we go Troll Phil Jimenez. I was game, and we headed over to his table expecting a huge line. Nothing. He was off to lunch, and Tone Rodriguez who was sitting next to him chatted with us a bit and was trolled instead. We moved on, then, to Jason Martin (J Martini?) and trolled him. Then some stormtroopers who were walking by. 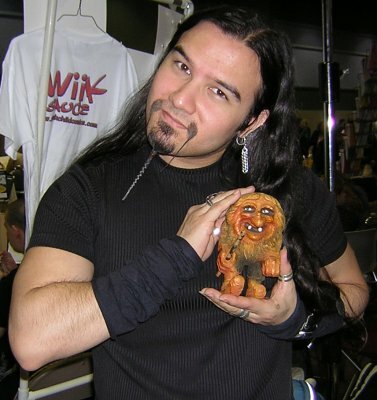 Then I trolled Mike Grell's old friend Masun, who I've seen at a couple of cons. We also trolled Ford Gilmore on our way out of Artists Alley toward the Hero Initiative booth to Troll Brian, Jim and Paris. Brian and Jim were around, and got themselves Trolled, but Paris was missing, so Heidi and I went back to home base, only to learn that we'd missed Paris by a few moments. After a quick consult with Eric, the three of us headed back to the Hero Initiative booth, where we caught up to Paris and Trolled her. Then Eric and I went to see if Phil was back to be Trolled. He wasn't there, but a line was forming, so I decided to hang out, chatting with Tone and Joss, his rep. We talked for a bit, as Eric grew increasingly bored. Finally, Eric said he was going to go find a Coke. Tone asked if he could get one too if he treated Eric. And so Eric headed off to the concession stand with Tone's money while Tone and I continued to chat. I showed Tone Eric's sketchbook, and he decided that, since Eric was off being a minion for him, he would do a sketch for Eric. He drew a very cool Green Lantern/Oz ring. As I waited, I also Trolled Raven Mimura, who was just around the corner from Tone and Joss. But most of the time I spent in front of Tone's table chatted with him and Joss. I showed Tone my sketchbook and talked about my first sketchbook, with Nick Cardy's sketch in it. Joss mentioned that they were going to be at a con with Nick next weekend, so I wrote a little message on one of my cards and asked Joss to give it to Nick if at all possible. She said she would try. After waiting for Phil for nearly an hour, Eric and I decided to move on. Joss asked for my phone number, though, so she could call me when Phil returned. I gave it, and Eric and I left. On the way back to home base, we stopped at the Spanish Artists' booth again. I'm still kicking myself (repeatedly) for not Trolling all of them, but I was... in a word... intimidated. I did get one last talk in with Esteban's translator, in which I told Esteban that he'd made the con for me. The translator didn't understand until Eric translated, explaining that meeting Esteban was the highlight of the convention for me. I thanked Esteban and his translator profusely, and we moved on. A note on the panels: I tend to not go to panels at conventions, unless someone else prompts me. I always feel like there isn't enough time, then I sit for an hour smelling marker fumes in front of Tone Rodriguez's table waiting for Phil Jimenez. *Ahem*. But I usually spend my time at a con on the floor of a con. Not that the selection of panels was shabby! No, there were some great sounding panels on the list this year. I considered attending the DC Nation panel on the first day, but forgot about it until it was too late. And hubby-Eric wanted to attend the Trailer-Park panel, but just before it was time to go to it, an announcement came on that it had been canceled. So, in the end, none of my crowd made it to the panels. If I'd been thinking, I would have at least checked out the panel area, but I was too busy being the Troll-Lady to be normal. We got back to home base just in time for the charity drawing at Space Goat. Somehow I became the person who drew the names out for the prizes. I eventually pulled a winner who was in the crowd waiting, to many cheers. Jason Metcalf himself drew the winner of his piece. After which he was Trolled. The proceeds of the drawing were to go to the Hero Initiative, so a trip down to their booth for a presentation ceremony was planned. Then my phone rang. Phil was back. Jason, Heidi, and I proceeded to the Hero Initiative booth, which was overcrowded and loud due to the arm-wrestling competition (as seen here). After a quick consult, Heidi and Jason decided to do the presentation later, and Heidi and I hurried to see Phil. When we got there, we were told that Phil was waiting for us, so once again we jumped the line and quickly trolled someone. Right after trolling Phil, and before we could step more than a couple of steps from his table, I was hailed by Jonathan Miller, aka Morgan Minstrel. He recognized me because of Torvald. 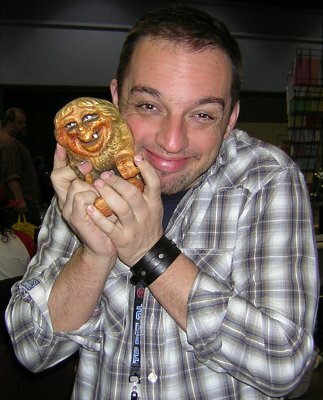 It's not like there are that many hand-carved Norwegian trolls hanging out at comic book conventions, I guess. If I'd been thinking, I would have trolled Jonathan, but I zoned out because of the odd Phil Jimenez thing. I'll get him next time! And, as a sort of consolation prize, I posted my sketchbook advice on his LiveJournal. As we headed back home, I noticed a really long line, and realized that it wasn't for Ed Brubaker, but for JMS. I stepped to the front of the line and asked the woman who was next in line if I could take JMS's picture with my troll. 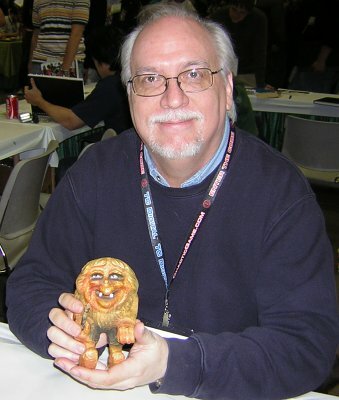 She agreed, amused, and I trolled J Michael Straczynski. Heidi was bemused, and kept telling me how cool it all was. Yes, actually, taking pictures like this is pretty darn cool. When we got back to home base, I picked up my hubby-Eric to take him to meet Erik Thompson and get a Green Lantern sketch. While Erik sketched for Eric, I went paTrolling and met Matt Maxwell, who remembered me from my Usenet days (yikes!). 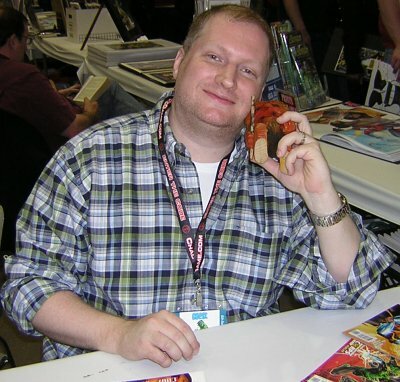 I also trolled Brian Churilla, Mike Maydak, Arthur Suydam, Tom Raney, and Jim Cheung. When Erik had finished his sketch (Dexter from Dexter's Lab as GL), hubby-Eric went to ask Aaron Williams for a Green Lantern sketch. I trolled Amy Pronovost and Steve Gallacci, then started showing off my Aquaman sketchbook (with both its new sketches) to them. Amy wanted to give Aquaman a try, and so produced an excellent sketch. Then Steve added an AquaOtter. Hubby-Eric came over with a wonderful sketch of The Flea as Green Lantern by Aaron Williams, and Amy gave him a sketchcard of a Jawa ("so I don't have to haul it home with me!"). You could feel the con was winding down by that point. Eric and I headed back to home base through the retail section, and I got a Sword of Atlantis and King Shark Heroclix. I wanted to get an Aquaman with Starro on his face Heroclix too, but it was a bit much for our budget. Back at the booth I trolled Michael Alan Nelson, then the Teenage Kung Fu Cottontails in the booth across the way (please, just don't ask. Really.) and lastly I trolled Shon Bury, who came by. I met a lot of cool people, saw folks I like, chatted with creators and fans, and in general had a good time. Except for the illness on the first day and the pain on the second, it was an EXTREMELY good con. By the Numbers: Eric's Sketchbook - 3, Doctor Who Sketchbook - 2, Aquaman Sketchbook - 9, Lisa's Sketchbook - 3. Most sketches: Aaron Williams, who did one for each book. Troll pictures: 66 taken by me, one by Brad Guigar. Anxiety attacks: 2, both on Saturday while in lines. Notes to myself: Next con don't bother trying the freebie table first, just dive right in. Bring a smaller bag along with the regular con bag. I need to make and bring an Aqua-character reference book (including Mermaid Man). Eric and I stopped Jim to ask about the Emerald City jerseys that Eric was lusting after, and learned that they were for 5-year con staff only... I spent about 2 minutes total in the gaming area, usually while moving past it... My local retailer said the show was excellent for her, with heavy crowds on Saturday... I talked with Cheyenne Wright for a brief moment to ask about Arcane Times: he's got too much on his plate right now... Several people told me that when they Google themselves, their troll picture comes up first... I saw another Androgum (our Doctor Who club) member on Saturday going past home base, and chatted with her for a moment... I saw some people carrying Spirit posters from the freebie table, but didn't try to get one myself... The announcements were very loud, and it was impossible to converse with a person next to you while they were going on... I'm still kicking myself for not trolling the rest of the Spanish artists... When Lisa and I headed to the garage for lunch on Saturday, we passed a woman carrying a heavy cooler. I realized I'd left my car keys in the booth, so we headed back and carried the cooler for the woman to her table in Artists Alley. On Sunday, I got cookies from the people I carried the cooler for the day before... The trolled cards were a hit, and I'm glad I made them... 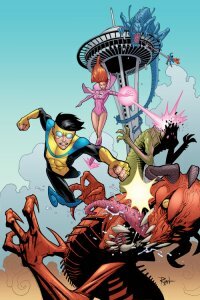 If you were at the con, be sure to fill out the survey and ask for Nick Cardy and Romana Fradon to be invited. Or maybe Linda Medley. Or Peter David. Or whomever you'd like to see.